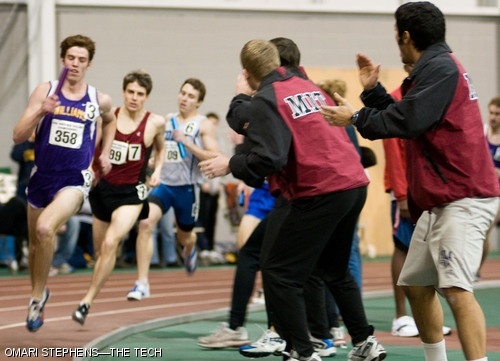 William S. Phipps ’09 tails the Williams College anchor leg as they run past cheering MIT athletes toward the final lap of the 4x800-meter relay, the final event of the men’s New England Division III championships. 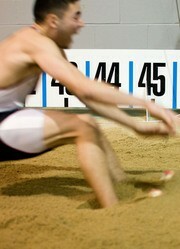 A finish ahead of Williams in the relay could have pushed the Engineers past Williams into 2nd place in the championship, but the Williams runner held his lead to the finish line. MIT placed 3rd with 101 points, behind Tufts University (118 points) and Williams College (106 points).